Picture the prairies of western Canada. A land of sprawling ranches, farmland and fertile fields. Rolling hills of green and golden wheat fields. Blue sky that goes on forever. For generations, farm families have engaged this land, producing wholesome, nourishing food products. This is not just a livelihood, it's a way of life. Canadian farmers value and respect the land and adopt environmentally sound practices to protect it. Sustainability is foremost. Food animals are carefully bred and maintained according to the highest standards of animal welfare. The result is superior food products from people who daily exhibit their integrity and dedication to quality. Western Canadian producers recognize the value of their products for a world market. Prairie Halal Foods was created to produce, prepare and promote these gourmet food products for consumers in the Middle East. Prairie Halal Foods is a privately owned company, a joint venture between a group of established and reputable Canadian food companies. 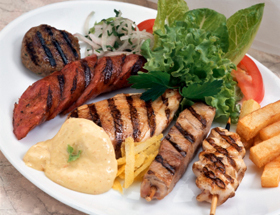 The mainstay is high quality meat that we offer to you directly from the producers. Add to these our premium Canadian honey and gourmet bakery goods and you've got a pantry stocked with delicacies that will impress even the most discerning of chefs and dinner guests. The Canadians behind these producer companies are like-minded individuals who have joined together with common values, goals, challenges and strategies. We invite you to learn more about our delicious, quality food products that will quickly find a place at the top of your list of favorites and the people who bring them to your table. Or contact us to find out where you can shop for these outstanding food items.